Play through 99 tracks and unlock secret powers in a theme park full of fun and surprises! Challenge yourself on the 4 courses of the Mini-Golf Masters ?? testing your power, speed, skill and smarts. Unlock their secret powers to send the ball past track obstacles like bumpers, spring jumps and teleporters. 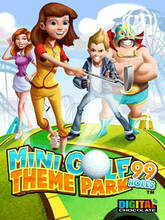 Get more holes, more objects and more fun with the most addictive Mini Golf game for mobile!